The first step in addressing denial when it comes to substance abuse is identifying the confusion that exists with regard to the vast amount of terms used in connection with the issue. To be effective, professionals and the general public alike must be clear about what we're talking about! a. 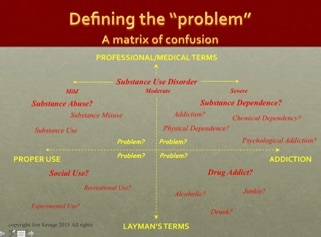 Substance Use Disorder is the medical classification for a condition that ranges from Mild to Severe. * substance use, misuse, abuse? * addiction? dependence? alcoholism? chemical dependency? * social use? experimental use? recreational use?